WHAT’S INSIDE Welcome to your new Back Pages! We love seeing God at work in the world of sport. With articles ranging from Northern Ireland to the Winter Olympics, and Sports Plus leaders to students at Clubhouse Xtra, we hope this magazine gives you plenty of reasons to praise our Heavenly Father as you start a new year. leaders. 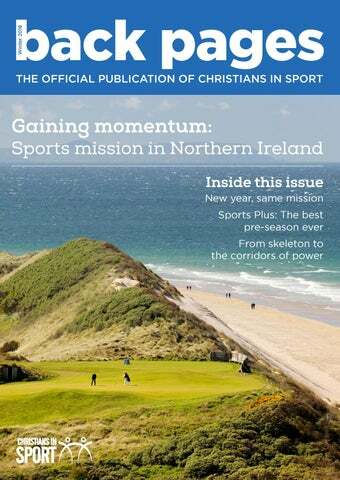 At the heart of this issue is the story of how God has grown the work amongst sportspeople in Northern Ireland. We yearn for this kind of growth for the sake of the gospel amongst sportspeople all over the UK, Europe and the world. We have a great God and terrific partners in this work of reaching the world of sport for Christ. This brings me to our Partner Evenings. Every now and again we invite our faithful partners in this ministry to come together in person to enjoy a catch up with each other and to get a further insight into the gospel growth that God is bringing about. This is a highlight for all of us who share in this God-given partnership. I really look forward to seeing you there! Registered Charity number for England and Wales 1086570 Registered Charity number for Scotland SC045299. Members of the Leeds Beckett University Group. been through post-match celebrations/ socials where the team often go on nights out, drink lots and in some cases attend strip clubs. Being part of the group but not getting drunk and refusing to go to strip clubs gives me an opportunity to explain what my faith means to me and why I do not want to act in those ways. What one piece of advice would you give to Christian sportspeople to help them share their faith? Keep persevering and be ready. Continue to engage, socialise and be around your teammates. The opportunities I have had to talk about the gospel, or even just give advice based on a different world view, have come few and far between. But they can quite easily come when you are off guard or really not ready for it. The challenge is to know what you believe, and be ready and bold enough to say something that could mean you get left behind or even become unpopular with your teammates. NEW YEAR, SAME MISSION Clubhouse Xtra, our new year student conference, kicks off in England on 2nd January and a day later in Northern Ireland. Here, Bath University rugby player Bertie Kennedy (pictured below) shares what he’s looking forward to. to equip and encourage us as we go back to our various universities, to reach this world of sport for Christ. It is a massive encouragement to see that there are a great number of workers in this harvest field, fighting similar challenges, encountering the same lows and rejoicing in the highs that Christian mission brings. The training is focussed on helping us pray, play, say; living our lives with integrity and speaking of the gospel to our teammates. It has become a constant reference point for me at uni and many of the scenarios we practised have happened in real life! A great example was a talk where the process of ‘Jesus and a question’ was first explained to me. Mentioning Jesus and then asking a question about Him when discussing what I got up to on the weekend, or over the summer, has unlocked so many conversations with my teammates! The evening meetings are always a highlight. Hearing God’s word and seeing how He has changed the lives of the students there or their friends, shows we’re not involved in a pointless exercise! As I head back for my final year, I can’t wait to hear of those who have come to faith, to see brothers and sisters running the race and be challenged again by the gospel - seeing just how relevant and life changing it is for my rugby mates. GAINING MOMENTUM: SPORTS MISSION IN NORTHERN IRELAND Although Christians in Sport was founded in 1980, the work in Northern Ireland only really got going at the turn of the millennium. Since then, it has been so encouraging to see sportspeople, churches and schools really grasping the vision to reach the world of sport for Christ. “I loved what they were about. 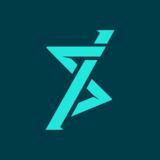 I continued to go to the Pray Play Say group at university, and signed up for the first Sports Plus in Armagh in 2004. This was so good, I’ve gone every year since, and it’s only got better. I then got involved in adult work, finding player gatherings really helpful.” Now a church leader, Maccers has a bigger picture of how the gospel is bearing fruit in the world of sport across the country. With 23% of adults belonging to thousands of clubs, Northern Ireland is a country that lives and breathes sport. Just consider the fact that school sports competitions, like rugby union, are shown live on BBC TV! If you love Jesus and your sport, what a mission field you have in front of you. Known as Maccers, Keith McIlwaine is the assistant pastor at Hamilton Road Baptist Church in Bangor. On hearing of Christians in Sport as a student in 2002, he joined the Queen’s University, Belfast group and has seen this growth at first hand. First staff member appointed to work fulltime in Northern Ireland. At its heart, our work is about helping Christians live for Jesus in their clubs and teams. With thousands of sports clubs in NI, there is a huge opportunity and need for Christians to get stuck in. It might be hard to pin down, but is there one thing that stands out for you as key about Sports Plus? That’s awesome. Are there any other ways that Sports Plus impacted your own faith? P: I loved the focus on excellence in everything – it was really challenging. The second thing was the clear Bible teaching presenting the gospel (That’s two, but we’ll let you get away with it!). D: I love hearing the gospel so clearly taught in its wholeness. It’s not just a camp for young people to take away, I take away every single year. B: A highlight for me is the evening meetings. Sitting at the back, watching a couple of hundred young people jumping in their seats, all this kind of banter and fun, and yet through it all worshipping God. You just sit there thinking ‘where else do you get that?’ I: One of the girls on my team said the treatment she received from one of the physios made her notice ‘she’s so different’. Just watching that physio not even realising the impact she was having, by caring, by asking questions - God was using that. gives you a great reminder that I need to speak of Christ. I: I come away with a confidence that the gospel is for everyone. That it is what my teammates and my friends need. You’re reminded that the gospel is powerful and able to save anyone. P: In one of the training sessions, we were reminded about how many sports teams there are in the UK and challenged ‘are we being part of those teams, do we have the urgency of reaching the world of sport for Christ?’ B: I made really great friends in the medical team that I was in, who I am now in touch with after camp. It’s just hugely encouraging that God knows what we need and puts those people in place. at one point. There were practical jokes we were playing on each other. I miss that in a lot of areas of my life now! P: Mike Smith, the head rugby coach, always gave me a list of warm-ups I would be showing the young people the next day. We had many an evening of him laughing at me as I tried to figure out what a reverse lunge with twist was! I: This summer, we tried to write out a rap from Fresh Prince of Bel-Air to perform for our team song in the evening meeting. It was good in practice [laughs]. We were nailing it at the dining table, but when we tried it, we couldn’t quite squeeze it in! It was a bit awkward but quite funny as well. Northern Ireland beat England at football. It’s quality! Lastly, could you sum up Sports Plus in three words? P: I would say ‘fun, friendly and focussed’. B: I went for ‘glimpse of heaven’. I look at Sports Plus and think if that’s a little bit of what heaven is going to be like, then I want to be there. I: For me, it’s ‘Bible, banter action’. D: I went with more of a sentence, if I am allowed that? As it happens in the summer, how about ‘best pre-season ever’? “It’s a weird and wonderful mix of people, quite eclectic in some ways. You have got members of royal families, sporting greats and then you have people who don’t really have that much sporting history, but have great experience in other areas. “Because there are often elections going on, it is hard to make deep friendships and establish trust. But when you are there, in some ways it’s like a family.” Six years after retiring, Adam still fondly remembers his time competing, especially his Olympic debut at Turin 2006. “There was just so much to see and the atmosphere in the Olympic Village was just incredible. It was a place people had dreamed of, and wanted to be, most of their lives and now they had made it. “There was a real euphoria, particularly around the opening ceremony and the early part of the Games.” Skeleton involved four one-minute runs producing a cumulative time. As an IOC member, Adam faces many big decisions, so how does he prepare? “I will try and read as much as I can, so I have got as much information as I can; bearing in mind where that information has come from, and what that person or group’s agenda might be. “Then I pray and ask for God’s help and His wisdom because numerous times I have thought ‘Lord, I don’t know what to do here, please help’.” Adam has a great opportunity to witness for Jesus among his colleagues and the staff, but he says the political nature of the IOC also throws up many challenges. To hear more from Adam listen to christiansinsport.org.uk/olympicpodcast and look out for a new interview with him in February. The official publication of Christians in Sport.